Orbee Tuff Orbo. This is one of the first toys I ever had. When I was a puppy, Mom put tiny pieces of healthy dog food inside it for me to bounce around and get out. It was pretty entertaining! Over the past year, my play-style has changed a bit. I really prefer to play fetch, chase, and tug with Mom. When Mom is playing fetch with me and the Orbo, I really enjoy it; however, I never bring the toy to her on my own to play. 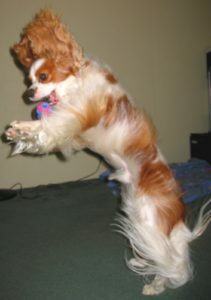 But, when Mom tosses it up in the air for me to catch, it really is quite fun! Does your dog enjoy food-filled toys? Tell me in the comments.